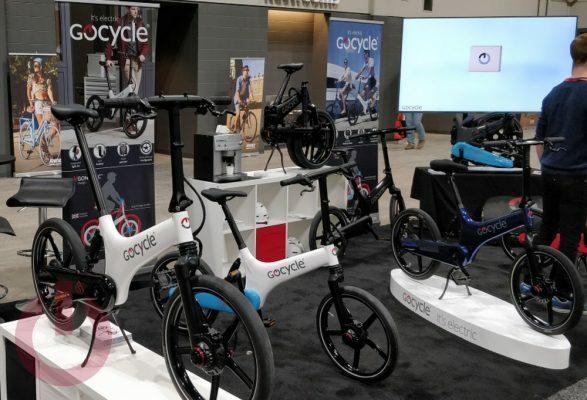 I don’t know much about electric bicycles, except that they are fun to pass, so I was glad to get the chance to talk to Gocycle about their bicycles as CABDA. There are a few things that make them stand out compared to the other electric bikes out there, with the not-a-standard-bike design being the thing that most attracted me to it. By rethinking how a bike should look, and work, Gocycle created something that is highly functional and relatively light (the GS model I had a chance to ride is ~36lb / 16.5Kg) for an electric bike. The clever bits don’t stop there though,with a slew of easy on/off accessories and access to the battery. Unfortunately, I forgot to get a photo of how the front-to-back interchangable wheels come off. So much easier than a standard road bike. The most interesting thing about how the bike is how it rides, with power delivery onset configurable via the app, alongside the critical stats. I rode it in two different setups, the first with quick power on, the other quite a bit later. In both cases the electronic assistance feels a bit like an old turbo car. Where you are going, going, then GOING… In the short circuit at the show it was very difficult to get a good feel for how natural this would become on a real riding experience. My initial thought (besides the “that was fun”) is that I would prefer it to come on in a much more gradual and linear manor, but that could well be possible with more tweaking in the application. 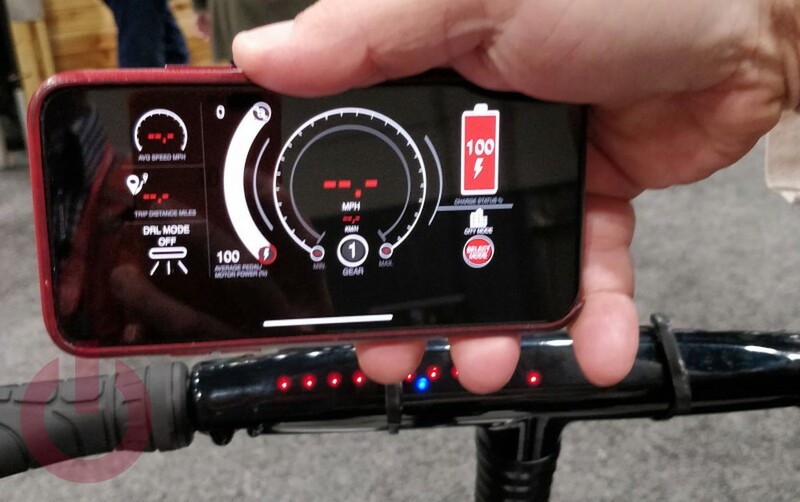 Oddly however, even though the bike speaks Bluetooth to the mobile, it doesn’t expose that data in a format that a real bike computer can consume. Which, at least for me, is a major annoyance. Unfortunately, their newest bike (the super compact GX) wasn’t available for riding, but I’m not sure that was really that critical. The use case for the GX is quite clear. Light (for an electric bike). Perfect for first and last mile commuting. Done. All in, I was really impressed with the Gocycle. 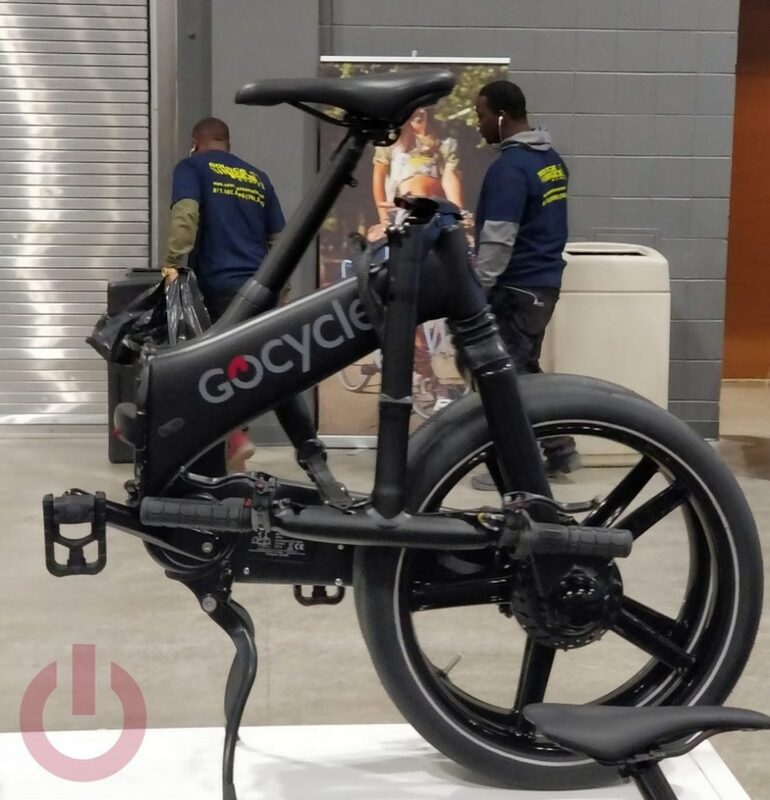 Like all electric bicycles it opens up cycling to a broader audience, but the repackaging of the bicycle in a form factor designed specifically for electric bikes makes Gocycle special. All the clever bits they add on, are gravy. Considering that electric motors generally deliver instant torque, it would seem that software is what is limiting the initial bit of acceleration – possibly for safety reasons? The app allows you to configure the level of assistance you want. I wish I’d taken a photo of it, but it was essentially a line graph which indicates the power (W) at which it should provide GO, and the ramp up. You can configure it to start at zero (or really close to zero). It’s a neat concept, and I suspect that it could work the way I wanted (less of an ON/OFF switch) given the way it seemed to work, but there wasn’t really space/time to have an in depth play with it. Would be a good idea for the company to provide three or four presets for that ramp – there will be folks that aren’t interested in creating their own or modifying a single default. My wife would be a good example.